Railpictures.ca - Bill Thomson Photo: CN C40-8M 2429 is pictured passing by the yard tower at Joffre Yard on July 11th 1991. At the time cowl-bodied GE C40-8M’s 2400-2429 were a little over a year old, making 2429 was the newest unit in the fleet (built March 1990). A second order for more GE’s would follow in 1992. | Railpictures.ca – Canadian Railway Photography – photographie ferroviaire Canadienne. 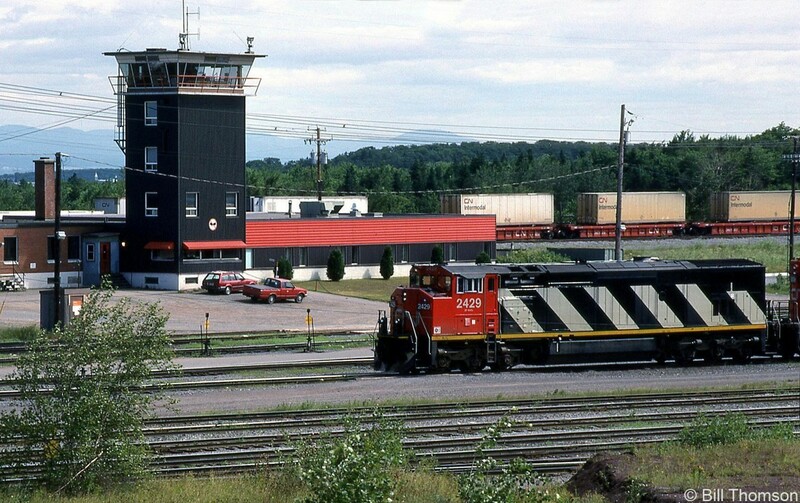 Caption: CN C40-8M 2429 is pictured passing by the yard tower at Joffre Yard on July 11th 1991. At the time cowl-bodied GE C40-8M's 2400-2429 were a little over a year old, making 2429 was the newest unit in the fleet (built March 1990). A second order for more GE's would follow in 1992.